We’re excited to share some up and coming papers we will be presenting at this year’s CVPR 2016 in Las Vegas (June 26th – July 1st)! 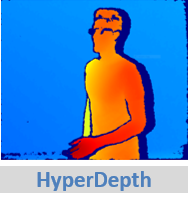 HyperDepth is a breakthrough for depth estimation using structured light. We cast the stereo matching problem as a classification-regression task, which we solve extremely efficiently using an ensemble of cascaded random forests. The algorithm scales in number of disparities, each pixel can be processed independently and in parallel. No matching or even access to the corresponding reference pattern is required at runtime. Our GPU-based implementation runs at a 1000FPS for 1.3MP input/output images. Global Patch Collider is a novel, extremely efficient, fully-parallelizable, task-specific algorithm for the computation of correspondences in images and videos. 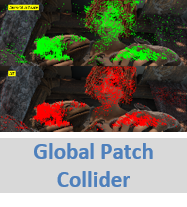 In contrast to conventional approaches that rely on pairwise distance computation, Global Patch Collider isolates distinctive pixel pairs that hit the same leaf during traversal through multiple learned tree structures. This makes the algorithm linear in the number of pixels. This entry was posted in News and tagged 3dreconstruction, correspondenceproblem, cvpr, cvpr2016, depthestimation, kinect, stereovision, structuredlight. Bookmark the permalink.